I mentioned on Facebook (What?! You aren't following "Clare's Contemplations" on Facebook? Go now, like the page and come back!) that I was missing my camera following our recent move. Well, I finally found it! I had taken photos for two posts and I am so glad to finally be able to get them up. The first one is this "recipe"! One of the biggest headaches when moving, to me anyway, is the dreaded "eat-everything-in-the-kitchen-that-you-can't-move-so-you-don't-have-to-throw-away-all-that-money-food" problem. I am not a super creative cook, and I really like to use a recipe, even if it is only for a springboard. However, you can't be that black and white when you are trying to make food humans will eat out of mostly condiments, leftover heels of bread and canned tomatoes. Anyway, I was looking in the fridge right before we left and I saw a container of partially eaten frosting and two cans of crescent rolls and this idea for "Double Chocolate Turnovers" was born! I would say it was providential, even. These are so simple, but they were really tasty. Preheat your oven to the recommended temperature on the crescent can. Unroll your crescent dough, and instead of separating it into 8 triangles, separate it into four rectangles. Firmly pinch the diagonal area formed by the two triangles that you have left together. Place the rectangles on a baking sheet and scoop a generous tablespoon-tablespoon and half of frosting onto one half of each rectangle. Flatten slightly with a spoon if necessary to keep it from being a mound, but there is no need to spread it out. Sprinkle 10-12 chocolate chips onto the frosting scoop, and add the desired amount of pecans. Fold the rectangle over and firmly press down on the three edges-you can use a fork if you like. Bake for 12-15 minutes until golden brown-be careful not to overcook, or all your frosting will melt out! Shortly before removing from the oven, microwave about 1/4 c. of the remaining frosting to use as drizzle. It will probably only take about 30 seconds to make it liquid. Remove the turnovers and use a spatula to carefully move to serving plates. 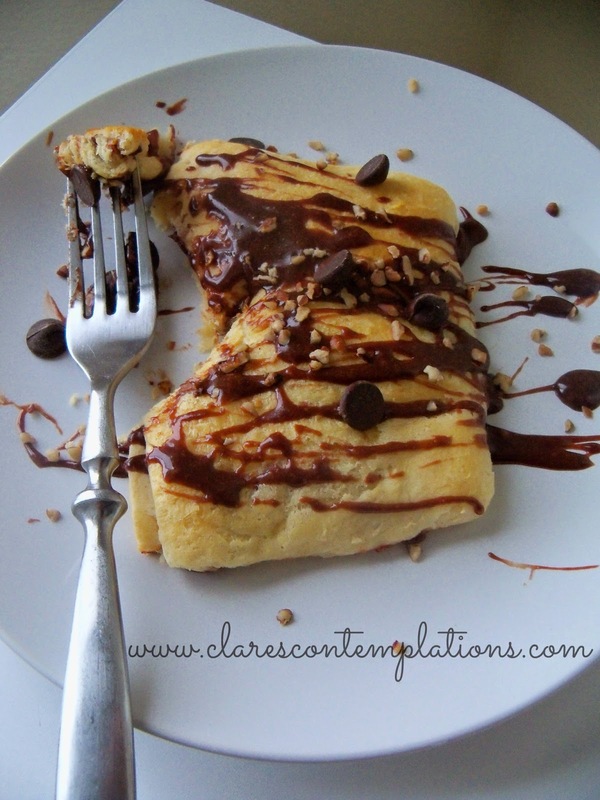 Drizzle (use a fork to make it pretty) with the melted frosting and sprinkle with more chocolate chips and pecans. Serve warm. 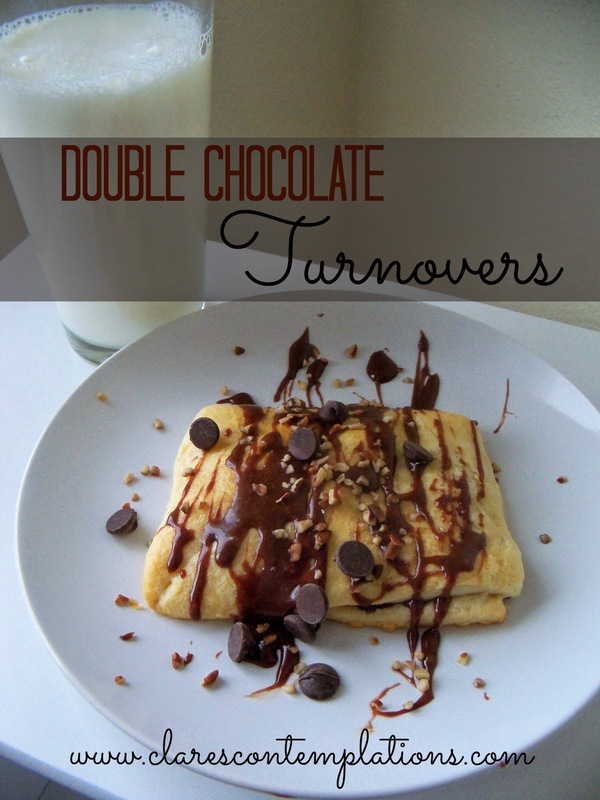 One can will make four turnovers. We ate ours with ice cream and a tall glass of ice-cold milk. For a dessert that takes about 5 minutes to put together it was really good. It was a great way to use up what I had left, but I would make these intentionally the next time. They would be great for breakfast, too, if you don't mind all that sugar! I think these would also be really marvelous if you served them with fresh strawberries or raspberries, but if you only use the crescents, frosting and chocolate chips you will still have a great dessert that takes precious little time and energy but looks and tastes delicious! Darkness. 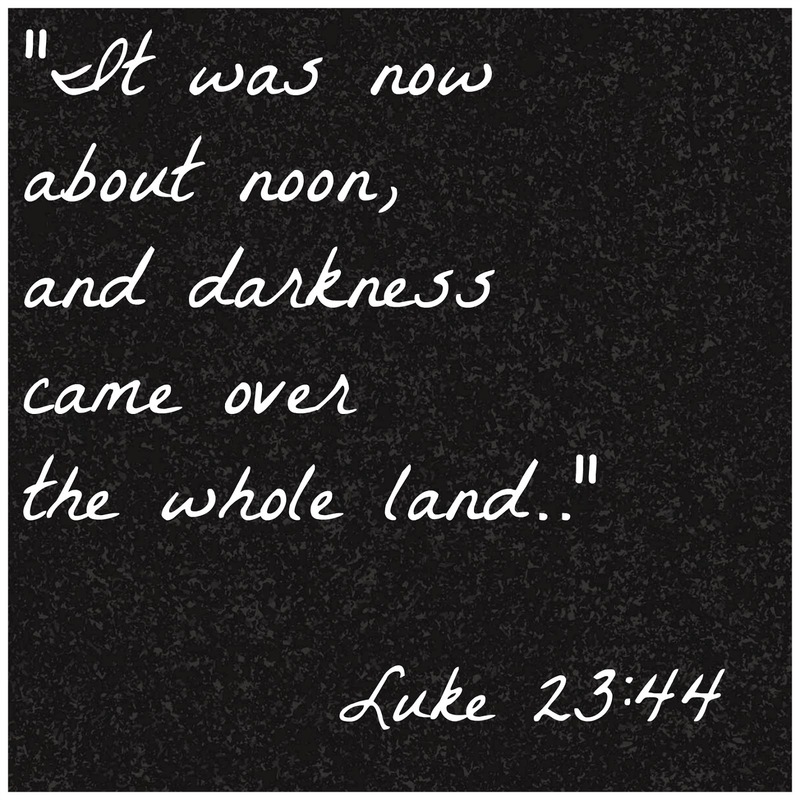 "Good" Friday, a day where the sun hid and sin seemingly ran rampant, appearing to blot out every good thing. Creation seemed to be unwilling to be a part of the perceived destruction of its Creator's Son. The sun closed its eyes to the horror, and sky grew dark with terrors and heartbreak over the sight. Death. It is finished. Jesus seemed to be done. The Great Work left with loose ends flapping. God, turning away, giving up-on His Son. On us. 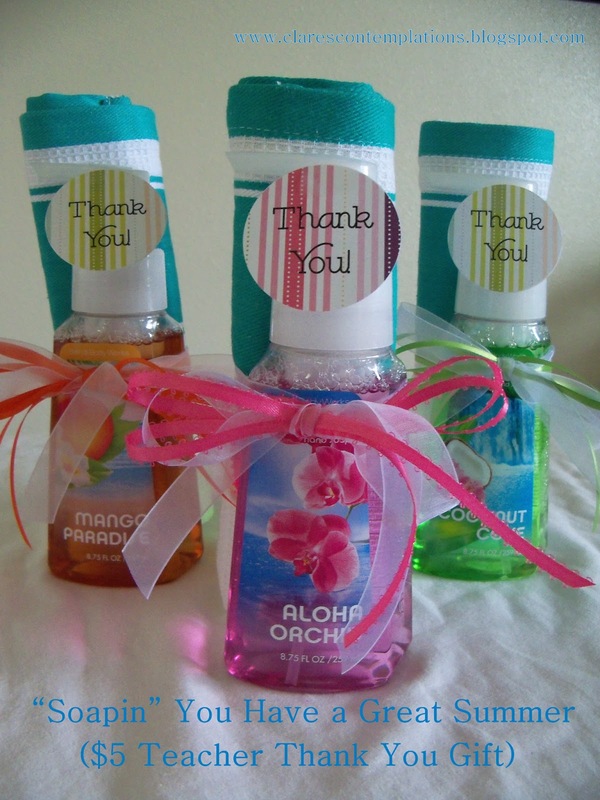 This time of year I always see tons of ideas for teacher thank you gifts. After a long year these faithful servants deserve a little special something, I think! However, you don't want just any old thoughtless thing you snatched up from the dollar bin at the grocery store, right? I love to give thank you gifts, so I have some much better (but still cheap!) ideas for you. You could also easily translate these ideas to graduation gifts, Mother's/Father's Day ideas, or if you added a gift card to bump up the value you could even use them to springboard off for wedding gifts! 1. "Soapin' You Have A Great Summer" Hand soap sets These are always welcomed because who doesn't need soap? It is so easy to put these together, and you get to adjust to your budget. Need a super thrifty gift? Dollar Store kitchen towel and some $0.97 Softsoap. Want to get fancier? Use Bath and Body Works soap and a luxurious bathroom hand towel! The saying is so "punny"- "Your "bubbly" enthusiasm made learning fun. "Soapin" you have a great summer!" 2. "Thirst Quenching Thank You" These are such a fun gift! They are especially great if you want to thank teens or older children (think Awana LITs, VBS workers, or school "buddies") but adults love them, too! It's a whole bottle of summer fun! I filled mine with ice pops, drink mix packets, bubbles, inflatable sponges and attached a tiny water gun. You can have endless options for ice pops and drink mixes, as well, if you wanted to use them for party favors. 3. "Carnival Prize Thank You" These were for my kids VBS leaders, but think of all the cute sayings you could put for a school teacher: "Thank you for an awesome "ride" this year! ", "You are a real "prize" teacher! ", "You were the "ticket" to a fun year!". 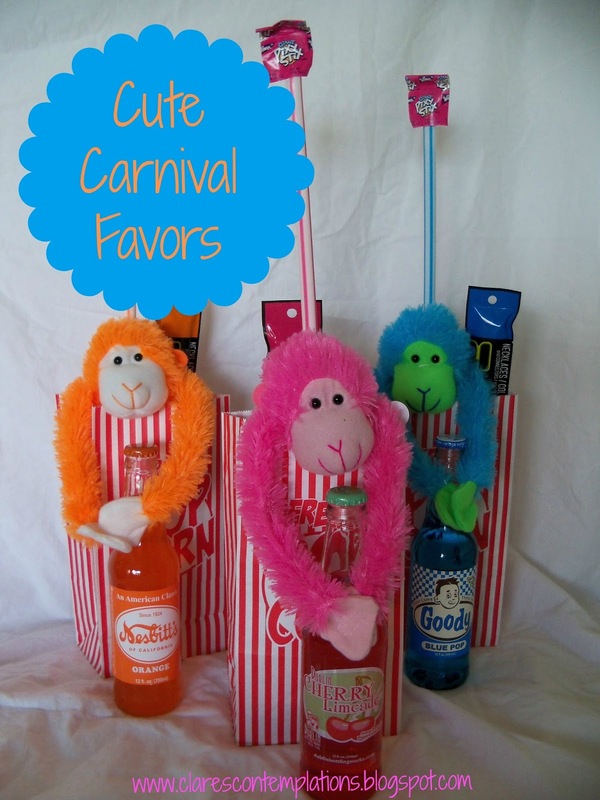 I bought sweet stuffed monkeys, glow necklaces, giant Pixie sticks and put them together with bottled "vintage" sodas in popcorn bags. Colorful and unique, no one will have a thank-you like this! 4. "Basket of Sunshine" This adorable gift was for a college student, but I can't think of any woman who wouldn't appreciate the things that are in it! The color coordination is what pulls it all together, so really you could do this with any color you wanted. I love bright, sunny yellow so that made it an easy choice. I found tons of yellow goodies: nail polish, gum, a candle, matches (which I quickly covered to coordinate, of course! ), a notepad and a specially selected Scripture, which I framed. When everything matches it is hard to resist! 5. "Relaxation Kit" This is the perfect gift if your budget is tight but you have lots of women that you would like to thank. The homemade bath salts are really what makes this gift shine. It gives it an incredibly thoughtful handmade touch. I don't think anyone would know that they are only about $1 for the *whole* gift, which includes bath salts, a sponge, a decorated candle, and better-than-Kisses chocolates. Hopefully this will get you started so that you can show your gratitude to the people who have loved, led, and instructed your child this year! And check back, because I always have people that I need to say "thanks" to, and I can't resist putting together these fun little presents and sharing them with you. So, this has been a very different birthday for you. You were born a Colorado baby, on Ft. Carson to be exact. (In my very pregnant mind, I didn't realize that your name matched your birthplace. You had a different name up until two weeks before you were born. I decided it didn't "fit" and we selected Carson, after my grandpa.) You have celebrated all of your birthdays in Colorado. You have always lived in Colorado. Until now. I don't think you have realized that we have moved yet and you won't get to see your Colorado friends anymore. That probably makes me more sad than it makes you. You seem to think that we are just visiting Grammy, but we aren't. We made a hard decision, to leave the state we loved, full of sweet friends, to live closer to family. And I think you will find in the future that you are glad we made that choice. Because you already seem to realize what an amazing gift family is-one that you can't take for granted. You love to be with our little family of four, and you delight in spending time with all your aunts, uncles, cousins and grandparents. I do, too! They are already noticing all the things that I love about you: you are a natural leader. You aren't bossy, but you aren't afraid to take charge. All the kids in our old neighborhood are probably missing you by now, because you are their ringleader! We were at Grammy's for six weeks last summer, and we were literally pulling into the driveway and they crowded around cheering that you were finally home. You can be a little stand-offish in new situations, but once you find your footing you are pretty secure. They can also see how loving you are. You might be rough and tumble (you love to wrestle with anyone!) because you are all boy, but you can be so sweet. You love to give hugs and still will let me hold you- that makes my heart so full. You are always eager to help, I think because you like to make people happy. I understand, because I feel that way, too. You are so perceptive, you notice when people are upset or sad. I think that is what makes you so smart. You are doing first grade math this year with ease, and you have learned how to read like a champ. You are so particular with your handwriting-if you make your letters wrong you will erase them of your own accord to fix them. I love your little bit of perfectionism because it makes it so easy to school you! Without a doubt, though, my proudest moment of the last year was when you accepted Jesus as your Savior. You knew that even though you are so young, that you needed Jesus. You love to ask questions about Bible stories and try to understand your Awana verses. You can always tell me what your Sunday School lessons are about-I know you are really paying attention. You still love the story of Barak and Deborah, and can recite it almost perfectly, but you also adore Samson, the fiery furnace, and Peter and the coin in the fish's mouth. You still love to be just like your dad, too. You put Tabasco on everything, you love your "comfy clothes" (gym shorts and a sleeveless shirt were two of your favorite presents), and talking about Avengers. You love for him to roughhouse with you, or play light sabers. He loves you so much, too. I am so excited to see what the Lord has in store for you. You bring so much joy to our family and I never stop thanking the Lord for giving you to us. 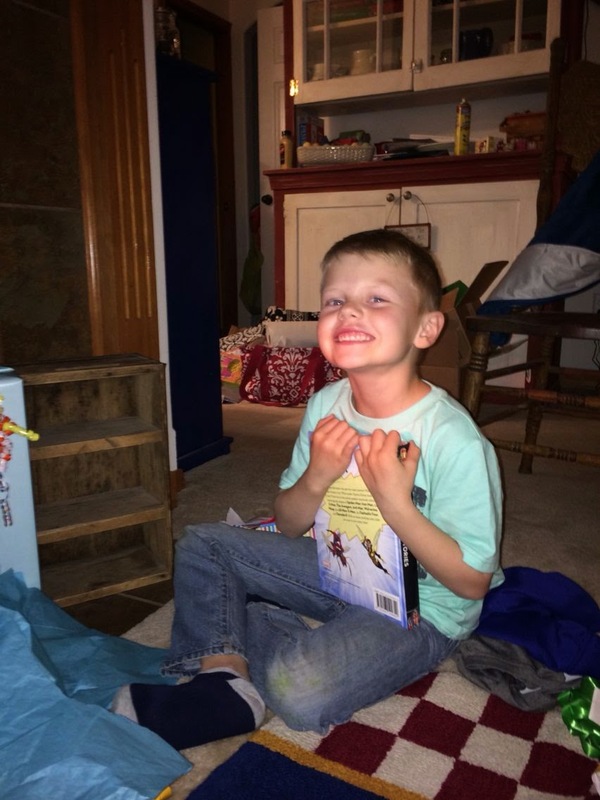 You are such an amazing little boy, I am praying that you will be the same type of man. Thanks for loving us, and sharing your sweet spirit.